You have 4 ingredients. You have to make a beautiful, impressive dessert. You have less than 1 hour. Go! What the &^%$ am I going to do with another 4 lbs of figs? [digs through freezer] Oooh, I wonder what’s encased inside this rectangular iceberg in the very back corner? Is that an emergency pie crust leftover from last Thanksgiving?! YEEEEESSSSS. And the fact that I didn’t even have an egg to make an eggwash for the crust mattered not. 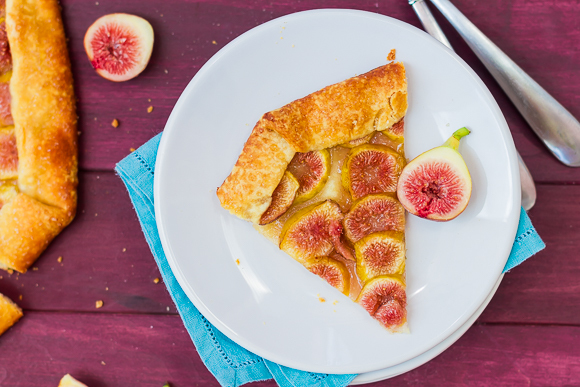 Although I will say, if you spend the extra 3.7 minutes daintily laying fig slices in concentric circles rather than throwing them inside a pie crust and hastily spreading them out, being treated like a total superhero is completely warranted. But the magical creation at the end will taste exactly the same: magical. If you follow me on Instagram, you’ve probably noticed that my feed has been full of pictures of figs and figgy things. 11 lbs in ~2 weeks, which means figs are finally getting their own blog category. But we had 4 ingredients: pie crust, figs, honey, and sugar. And we made a beautifully impressive, super simple, and magical dessert in under and hour. And now it’s your turn. Go! 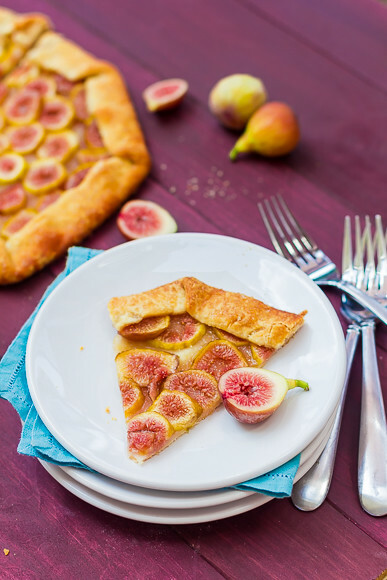 An incredibly easy and beautifully simple dessert with fresh figs, honey, and ready-to-bake pie dough. Unroll your pie crust onto a piece of parchment paper set on a large baking pan. 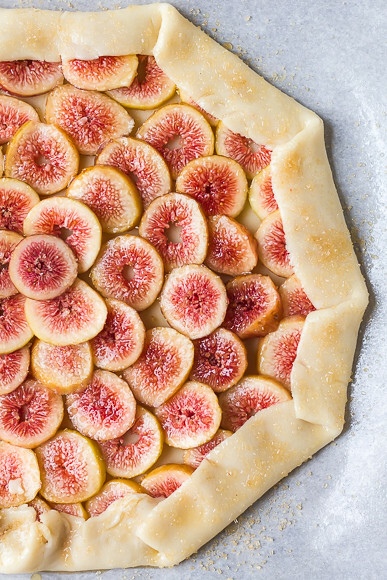 Starting about 1.5-inches from the edge of the pie crust, lay the figs in circles where they slightly overlap. Or start from the inside - you can't screw it up. 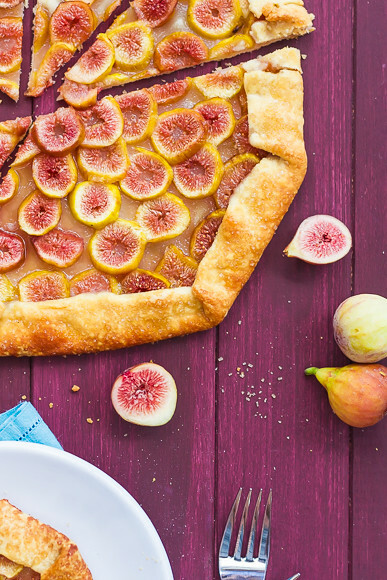 Fold the edge of the pie crust in so that it just touches the outer ring of figs. Heat the honey in the microwave with 1/2 tsp of water for a few seconds and mix well. 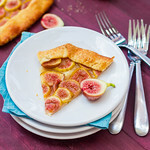 Use a brush and glaze the dough and figs with the honey. Sprinkle sugar over the galette and transfer to the oven. Bake for ~30 minutes until the crust is nicely golden brown. Remove from the oven, and let set for ~10 minutes before transferring to a rack and cooling completely. The galette is excellent served warm, room temperature, or cold straight from the fridge. With or without a scoop of ice cream on top. Honey and figs is heavenly combination! Oh man – so easy! And a perfect combination of flavours! 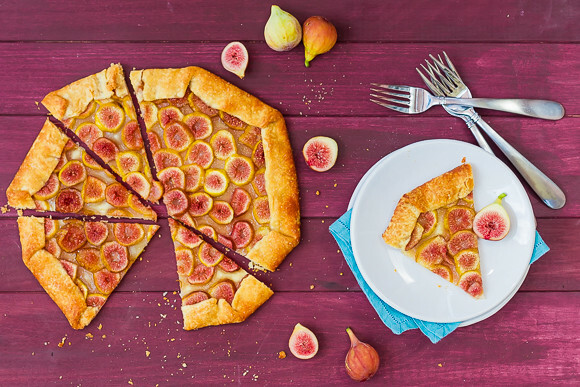 So, I totally volunteer to move in with you to help take some of those figs off your hands…especially if there are tarts like this in my future!